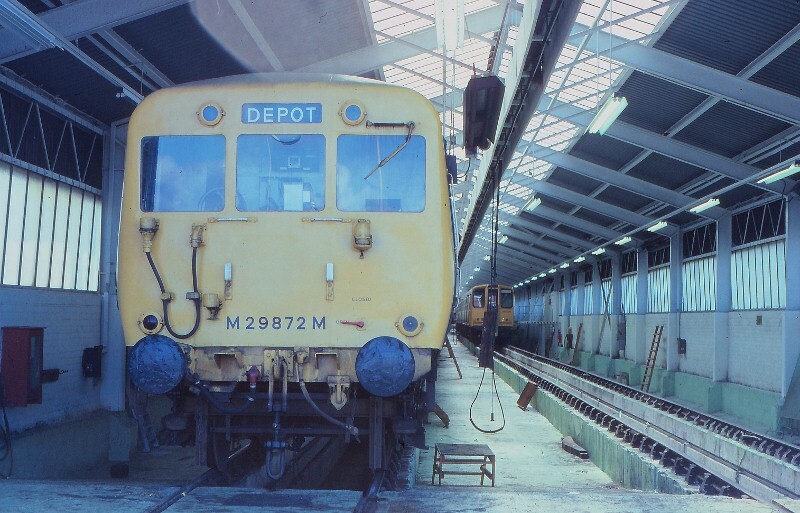 Martyn Hilbert's Railway Photography - Merseyrail Electrics - Class 502, M29872M inside Hall Road Depot. Class 502, M29872M inside Hall Road Depot. Hall Road Depot was opened by the LMS, in 1939, with the introduction of the Class 502s. The depot was their 'home' for over forty years until the vintage units were replaced by the class 507s in 1979/1980. Here M29872M is in the depot building, undergoing a routine examination in April 1979, whilst a class 507 is seen on the adjacent road. The depot closed its doors for the last time in 1997, and was demolished in April 2009. What a good home it would have made for the preserved Class 502 & 503 emus.